A few years ago there was this big hype and everybody wanted to have BeYu – Brilliant Shiraz aka BeYu – 209 because they thought it was a dupe from the famous and discontinued Clarins 230. So everybody was buying it but when I saw some swatches I wasn’t that impressed and decided to for-once-in-my-life think about my purchases and not get it. Of course then it was sold out and my head went like WHY DIDN’T I GET IT, NOW MY COLLECTION IS MISSING SOMETHING! Why do I always do that? Everytime I try to be responsible about my purchases I end up regretting it *sigh*. Anyways, I ended up getting it always when somebody didn’t liked the polish and decided to sell it. When the bottle arrived I wasn’t that impressed. The red color is stunning, I love red polishes, but it’s not prettier than other red polishes that I already own. The duo chrome looks pretty in the bottle, but it’s totally gone when it’s on my nails. Not just in my pictures, but also IRL there was hardly any duo chrome visible. I’ve used two coats over one coat A-England Perceval. If you use the polish on it’s own you need at least four layers since it’s very sheer. If you want the duo chrome to be at least a bit visible you have to apply it over a dark polish like black, dark blue, purple etc. 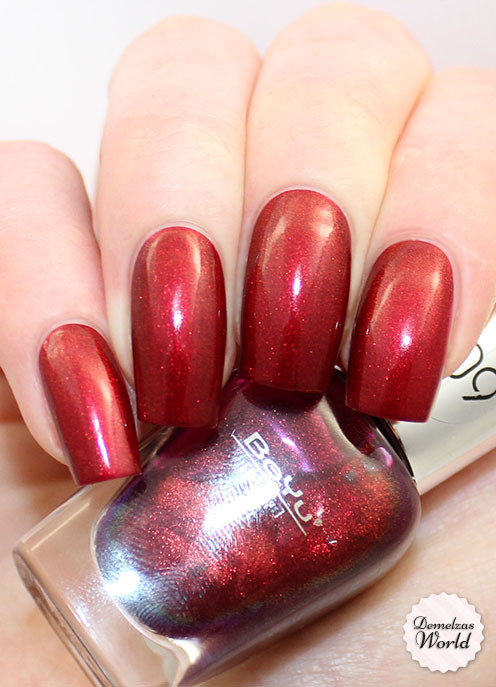 But still, I think the duo chrome finish is quite disappointing and if you layer it over black it get’s too dark, if you layer it over blue or purple it’s more a purple manicure than the nice burgundy reddish color that you see when you buy the bottle. 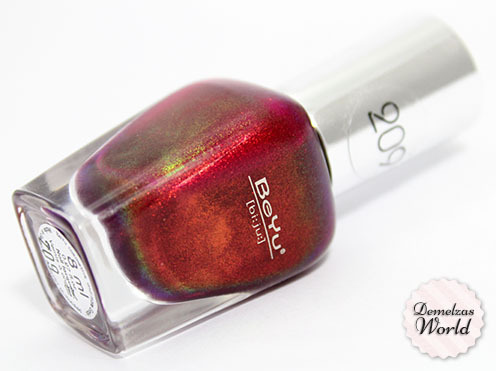 If I wanted a purple sheer duo chrome polish I would stick to my Max Factor Fantasy Fire that I can find here for just 5 euro’s. In my opinion he polish is definitely not worth spending too much money on and it’s not a dupe for Clarins 230 but it’s similar. If you want it and you can get it for a reasonable price do it, but if it’s expensive then definitely spend your money on something else. When you do decide to buy it always check the label, the old version has INCI31 on the label, the new version without the duo-chrome has INCI24. Hello! Altough the duo effect is not that strong, still worth having it.